VV CRV (VV Corvi). Modestly glowing in northeastern Corvus (the Crow), fifth magnitude (5.08) VV Corvi's name is as much a tangle as its physical nature. Through the telescope, we see a visual binary made of similar mid-F (probably F5) sixth magnitude dwarfs (magnitudes 5.84, 5.82) separated by 5.1 seconds of arc. The magnitudes are uncertain, but the leader is clearly somewhat the fainter of the two. They have no singular common name, neither Greek letter nor Flamsteed number. But they are distinctive enough for each to carry its own number from the Bright Star Catalogue, HR 4821 and HR 4822. They have in fact been called the "A-B pair." There are insufficient data on motion to compute an orbit, but at a distance of 278 (give or take around 9) light years, they are estimated to go around each other every 4500 years, which (from the masses below) implies a separation of some 800 Astronomical Units. Each of these stars is a spectroscopic binary, with respective periods of 1.46 days (for "A") and 44.1 days. The first was later found by photometry to be an "alias" for the true period of 3.1445 days: a false period that fit the then-available data. 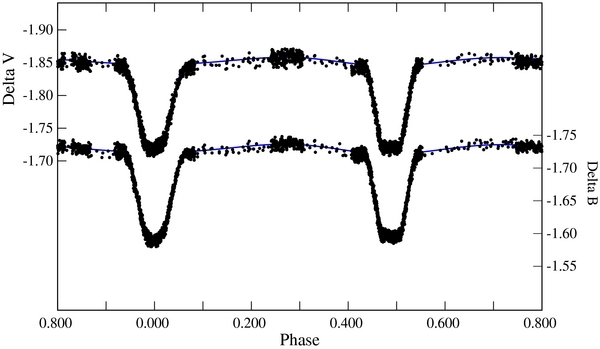 Photometry also revealed the fainter western star "A" to be a totally-eclipsing binary with a maximum variation of 0.15 magnitudes. Since the star is variable it was assigned the variable-star name VV Corvi, which has confusingly at times been applied to the whole system. Written byJim Kaler 05/19/17. Return to STARS.